How Brochure Racks, Magazine Holders, and Literature Racks can soup up your sales! Looking for something good to read? Even better, do you have something so good to read that you just have to share it with the world? When your counters are adorned with just the right literature racks, magazine holders, and brochure racks, all your very best reading material is perfectly displayed…and all eyes are on you. And at a trade show or in a kiosk where foot traffic is heavy, that can mean a lot of eyes and a lot of great exposure. At the counter where the crucial point-of-sale happens, a proper literature display can help add to that revenue – if not right then and there, at least you’ve increased your chances at future sales while creating return customers at the same time. The question is: what kind of literature rack or plastic brochure rack is best for your operation? It’s not only important to take stock of what your print advertising includes now, but what you’re planning for the future as well. A little simple math is all it takes. Is your current brochure selection focusing on eight top campaigns? 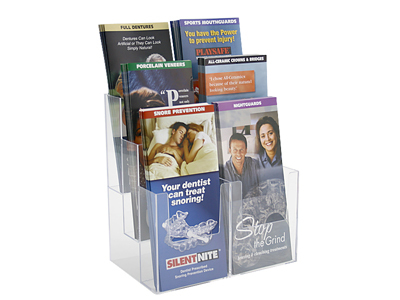 A 6 Pocket Plastic Literature Rack in two tiers might very well be your best option for maximum impact with pamphlets. Rolling out four new additional brochures in six months? 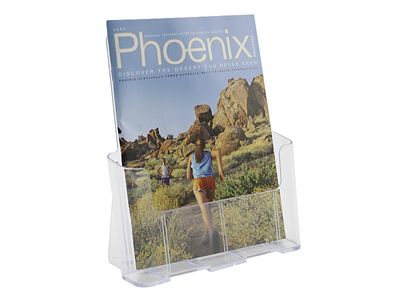 Consider a 12 Pocket Plastic Brochure Rack – just the ticket to grab your customers’ attention. One outstanding display is three pockets wide and four pockets high…and just one of many classic acrylic displays that ideally spotlight your 12 top promotions. Whether showing the latest medical products, a magical honeymoon cruise, or a variety of magazines, clarity and width can help catch the eye and draw attention. Industry specific literature or material for general consumption in a magazine format become an instant draw when shown in a Two Tier or Three Tier Acrylic Magazine Holder, and these are just a couple of examples. Something else to consider relies on the same logic major grocery store chains use when placing products on shelves: make those items you want to sell most appear at eye level. Did you know that grocery stores place lower selling items on the lowest and highest shelves while putting favorite best sellers right at standing eye level? This same psychology has its place in the way brochure, magazine, and literature holders are laid out, and this is important because you may want to consider wall mountable displays if counter areas are less strategic points for viewing. No matter where you place them, acrylic displays are a pure necessity and with so many different pocket styles and sizes available, there are multiple ways to get you noticed. And remember, language is no barrier either! Literature Holders and Pamphlet Holders make promotions pop! Remember that particular Literature teacher from school, challenging you to find the hidden meaning of words? While eager and maybe not-so-eager students continue learning the world of Literature, the term itself has a much broader definition beyond the school rooms…especially in the even larger classroom of business and commerce. The one common element is that not everyone is a big reader. That is, until those words are presented in the most appealing way possible! No doubt, you and your staff have invested a great deal of time, sweat, and dollars into your print advertising. And it’s not just the words that do the trick. Realtors display pictures of prime properties in glossy slicks, geared to hypnotize a potential buyer. Is that perfectly grilled steak and inviting margarita jumping from its display at your favorite restaurant? Is that long overdue vacation calling you because of the inviting scene in the pamphlet holder before you? That investment in your literature is all well and good, but without the right literature holder or pamphlet display, even the best words and most exciting pictures can end up forgotten or even worse, never seen in the first place! Let’s take a financial institution wanting to spread the word about lower home loan rates. Attractive, esthetically appealing literature holders made of superior acrylic are ideal for getting the word out, holding a healthy amount of promotional materials. Point of purchase sales are also on the rise thanks to counter top pamphlet holders who handle larger inserts. Newspapers and magazines sell like hotcakes when easily seen in wider custom displays and pamphlet holders, 9-1/2” or even 12-1/2” wide. Smaller magazines, flyers, exclusive brochures…the many sizes and styles of literature holders will put the perfect spotlight on these items and draw customers to grab them. 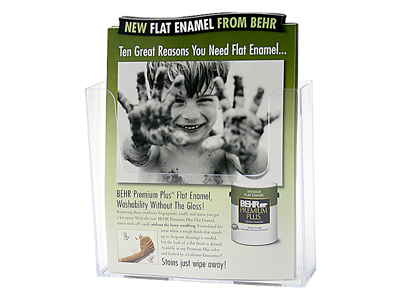 Holders for other items like CDs and mailers get a lift from superbly crafted acrylic, and display holders can go beyond the counter top for attachment to cabinets, doors, and walls. Meeting the eye and stirring customers to action – with a full array of literature holders and pamphlet holders to complement your promotional material, it’s a win-win. Class dismissed! 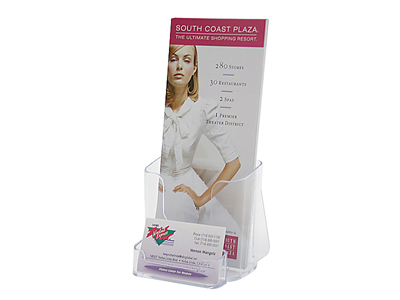 Counter Top Brochure Holders and Brochure Displays: what they are and why you need them! So, what are your counter tops looking like these days? Is there something missing? Maybe a little empty looking? When customers have taken the time and interest to visit your brick-and-mortar establishments, they’ve taken the initiative to come to you specifically…and likely want to spend money on your products and services. Excellent! You got ‘em in the door, and not your competitors. Maximize your opportunities to build that sale while giving prospects more options at the same time. Take advantage of that counter space to show them what you got. Done right, counter top brochure holders and brochure displays can almost serve as an extra sales rep. Here’s why. It’s not like displaying advertising literature in the store is anything revolutionary. Businesses have always done it and the methods for presenting this material were strictly in a supporting role. But in more recent years, businesses have had to become more creative to get a competitive edge…and every little detail counts. Enter the stylish world of acrylics. We’re really showcasing two prime examples now. One puts the spotlight on Wide Premium Brochure Displays…and you can bet that spotlight will shine even brighter on your brochures and promotional items. Offered in sizes 4” to 8-1/2” wide, this simple but attractive and highly functional display will turn your products into merchandising superstars. Want to go beyond the counter top? The good news is that these versatile brochure holders are wall mountable, too. exposure with a convenient business card holder in the lower tier. It’s a great enticement for getting foot traffic to use both hands and grab both your slicks and your card, too. 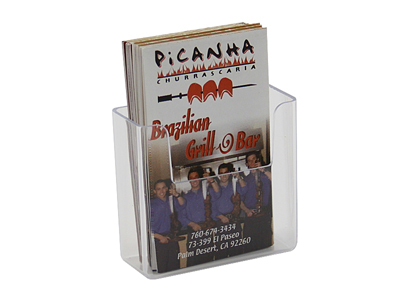 Have a look at Brochure Holders and Brochure Displays…and help your counter top light up the register! Plastic Products Mfg has established a Facebook Page where followers will have exclusive deals, contest and new promotions. Upcoming new products will be made available and at discounted pricing to Facebook followers only. The Official Plastic Products Blog can also be used as a reference for informative articles, videos, and upcoming promotions. Or simply visit http://www.plasticproductsmfg.com for more info. Plastic Products Mfg initiates the newest additions to it’s campaign expansion, PPM will exhibit online videos and feature monthly specials on specific products, available exclusively to online followers. In addition to continually updated information, articles, videos, and monthly product promotions, consumers and interested prospectors are encouraged to join Plastic Products Mfg’s online nation of Facebookfriends and take a closer look at the company’s Google + and LinkedInpresence. New entries in the “Plastic Products Mfg Blog” can be expected as part of the overall launch in enhanced multimedia. Stay tuned for more updated information…..